Here is an update to a British Christmas classic. 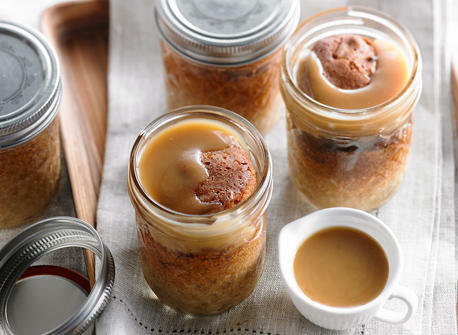 Serve in individual canning jars with a vanilla caramel sauce that your guests can enjoy pouring over their own puddings. Preheat oven to 350°F (180°C). Line a deep baking dish with 2 layers of paper towel. Grease 6 heat-resistant canning jars that can hold 1 cup (250 mL) each and put them in the baking dish. Prepare some hot water. Prepare the little plum puddings. In a small bowl, soak the bread cubes in the milk and set aside. In a large bowl, combine the dry ingredients, candied fruit, dried fruit, and almonds and set aside. Put the butter, brown sugar, eggs and milk-soaked bread in the bowl of an upright mixer. Mix until completely smooth and incorporate the dry ingredients using a rubber spatula. Fill the canning jars halfway. Cover each one with a square of aluminum foil and tighten the screw bands to seal them. Make a water bath by pouring hot water into the dish until the canning jars are covered two thirds of the way up. Cook in the oven for approximately 1 hour and 45 minutes. Let cool for at least 15 minutes before serving. Prepare the sauce. In a small saucepan, melt the caramels in the cream over low heat while stirring constantly. Increase the heat, add the butter and whip until the sauce boils and has a uniform consistency. Serve with the plum puddings. Get a head start: The plum puddings will keep at room temperature for several days if they are sealed with their covers. You can heat them up in a water bath in the oven with the aluminum foil and screw band for 20 minutes before serving. Reheat the sauce in a small saucepan or in the microwave. Practical tips: If you use canning jars with hinged lids, make sure you remove the rubber ring before baking. Tips: You can make a syrup with 1 tbsp (15 mL) of Scotch heated up with 3 tbsp (45 mL) of water and 2 tsp (10 mL) of sugar. Pour a few drops on each of the cooked plum puddings and then seal with the covers. Let soak into the pudding for at least 2 hours. You can double the sauce recipe and use any remaining sauce as a topping for ice cream or white cake. The sauce will keep in the refrigerator for at least 1 week. 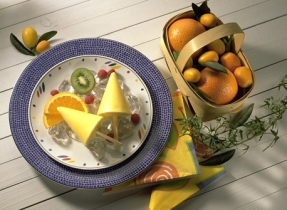 For a flavour twist: Replace the dried fruit in the recipe with apricots, dates, Saskatoon berries or figs. 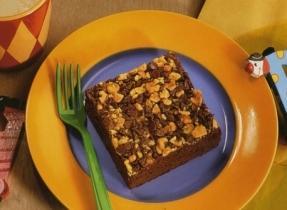 Replace the almonds with roasted crushed hazelnuts. Add 1 or 2 tsp of Scotch or whiskey to the sauce.